There are many generalizations about traditional Russian cuisine – too many calories, low on vitamins, and a lack of fresh vegetables because of harsh climate conditions in the region. 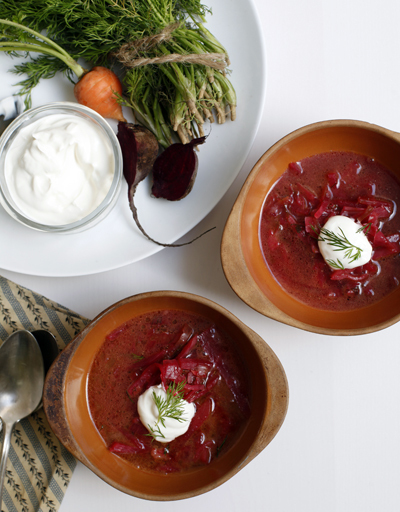 Borscht, the light, but hearty and comforting soup is a wonderful exception. We couldn’t be more honored and excited to be a part of OnceWeds’ voyage into the print world. The story's theme, Poseidon’s Daughter, inspired us to create a seafood dish worthy of the Gods. Not unlike OnceWed’s leap into a new medium, we also wanted to explore new culinary terroir--molecular gastronomy. Our quest lead us to the doorstep of New York’s WD-50 Restaurant. Unable to get our hands on Soy Lecithin, these generous gents lent us a small portion for our citrus foam. Thank you, WD-50, for your kindness and your magic powder.